For Theissen, 1 Corinthians 7:17-20 is central. It is not against the Law, but against Gentiles trying to be Jews. As such, it is a “hermeneutical key” for re-reading Paul’s attitude toward the Law (p11). Paul and the Gentile Problem develops this in two stages. Part one consists largely of clearing the debris of anti-legalist and anti-ethnocentric readings. Key to Thiessen’s argument is the variety of Jewish viewpoints on conversion. Chapter 1 outlines five approaches that Jews took as solutions to the Gentile problem: sympathy with Judaism, ethical monotheism, eschatological salvation (whether through full conversion or otherwise), full conversion, or exclusion, the latter believing that “gentiles can never become part of the Jewish community” (p24). It must be added that several of these views can be combined, such as the God-fearer who worshipped the one true God of Israel without taking on the Law. Now, in bringing these perspectives to Paul’s letters, it becomes clear that Paul and his opponents battled over this very issue. Paul’s opponents “preached that gentiles-in-Christ needed to convert and become Jews” (p26). While Paul the Pharisee once similarly believed that Gentiles must fully convert (Gal 5:11), in light of Christ he now believes such an attitude is horribly wrong (Gal 2:14). Chapters two and three tackle two texts that most appear contrary to Thiessen’s thesis: Romans 2:17-29 and Galatians 4:21-31, which “are central to both anti-legalist and anti-ethnocentric readings” (p12). With regards to Rom 2:17-29, Thiessen argues that the self-proclaimed Jew (Rom 2:17) is in fact a Gentile claiming Jewish identity through pride in his circumcision. Contrary to views that believe Paul redefines Jewishness in Rom 2:17-29 by trivializing ethnicity and circumcision, Thiessen’s re-reading concludes that circumcision profits Gentiles nothing, and is insufficient (but not trivial) for Jews. Thiessen also reconsiders Gal 4:21-31 and Paul’s reading of the Abraham Narrative. 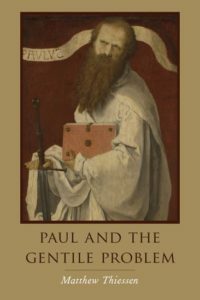 Many conclude that Paul must be fudging the Abrahamic texts, since in themselves they do not support his argument. For Thiessen, Paul reads the texts in a legitimate way that neither “attacks Judaism or Jews…nor denigrates circumcision or the Jewish law” (p87). Paul uses Ishmael as an example of one who is circumcised to no benefit, revealing that not all circumcisions (e.g. Gentiles) “have covenantal implications” (p88). Part two moves to present a positive case for solving the “Gentile problem.” Chapter four holds that while “circumcision and adoption of the Jewish law are a dead end for gentiles”, perhaps surprisingly “Paul agrees with his competitors that gentiles must somehow become genealogically descended from Abraham” (p105). This is key. In Abraham, the promise is to be found. But if circumcision does not make one a child of Abraham, what does? The answer is Christ. Through faith in Christ on receives the spirit of Christ. Christ is Abraham’s seed, so the reception of Christ’s spirit makes one a seed of Abraham also. So while gentiles “remain sarkically gentile, gentiles-in-Christ have now become pneumatically connected to Abraham” (p120). In other words, Gentiles are saved and enter Abraham’s family as Gentiles. Gentile believers are thus not “true Jews” or “spiritual Israel”. They don’t need to be! Chapter five explains the substance of the blessing for Gentiles in Abraham. The answer lies in the gospel being preached to Abraham (Gal 3:8) and the giving of the Spirit being promised to Abraham (Gal 3:14-16), texts that embarrass many, since the giving of the Spirit is not found in Genesis 12-25! However, Thiessen uncovers a neglected, but prominent, interpretation of Gen 15:5 that the star-like nature of Abraham’s seed refers not only to quantity but also quality. Numerous texts before and after Paul’s own time explicitly make this connection. This includes Jewish and early Christian writings, even Daniel 12:2-3. How is this relevant? The logic runs like this: 1) Abraham’s descendants were promised to become like stars, 2) stars were associated with divine beings (Ps 148:1-3; Job 38:4-7), and 3) divine beings/angels were spirit-beings (Heb 1:7); they consisted of spiritual “matter”. Therefore, 4) Abraham and his descendants were promised the spirit. This means that Gentiles who have received the spirit of Christ, and without recourse to the Law, are already experiencing the promise to Abraham and power over morality and mortality. This is the solution to the Gentile problem. Due to size, this review is split in half. Check back Thursday for my response.